Bride gift from groom? What is this all about? It is customary for the bride and groom to exchange a gift with each other to commemorate their special day. This is usually done the day before the wedding or the gifts are given for each of them to open just before walking down the aisle. Jewelry is by far the most traditional gift to give your future bride – such as a strand of pearls, a silver bracelet or earrings. There are all kinds of suggestions out there in all kinds of price ranges. Sadly, you will find that most are quite frivolous in nature. For example, a popular wedding website for brides is The Knot, which attracts 11 million unique visitors in the month of June, alone. In their “Wedding Shop,” they have suggestions for brides such as: silk kimonos, personalized tote bags, hangers, alcohol flasks, coffee mugs, etc. It is understandable that with the cost of weddings being a major investment these days, the bride and groom may need to settle for more inexpensive gifts, but has our society really digressed to this? It is perfectly fine to want to give a fun and whimsical bride gift from groom and perhaps give a couple of these small gifts, but do not let this be “the” gift you give in honor of your wedding day. The two most important things to remember: Give something meaningful, and give something timeless. You can’t go wrong if you remember these two tidbits of wisdom. Give something meaningful that shows your future bride that she is in your thoughts and that you put your heart into a special gift just for her. A gift that says, “I can’t wait to spend my forever with you.” This could be something as simple as a handwritten letter in a beautifully embossed box. Or something such as the lyrics to “your song” fancifully written and framed for your new home. But most important, give a timeless gift. Something that will be kept and shown to your future grandchildren. This gift should not be an item that will be out of style or thrown into a garage sale at some point. Your gift should convey your love for her, and be a treasured keepsake. It may seem cute to give your bride a plastic cup that says “Wifey” on the outside, or a cosmetic bag that says “Mrs.”, but be sure to include a more remarkable item, worthy of being kept. Remember to give something meaningful and timeless. Our Heartfelt Books make an excellent gift for a groom to give his bride in honor of their wedding day. I gave my bride a Heartfelt Book just before we were to walk down the aisle. I wanted her to know just how much she meant to me and how I couldn’t wait to spend the rest of my life with her. The book detailed all that I loved about her and our life together so far. 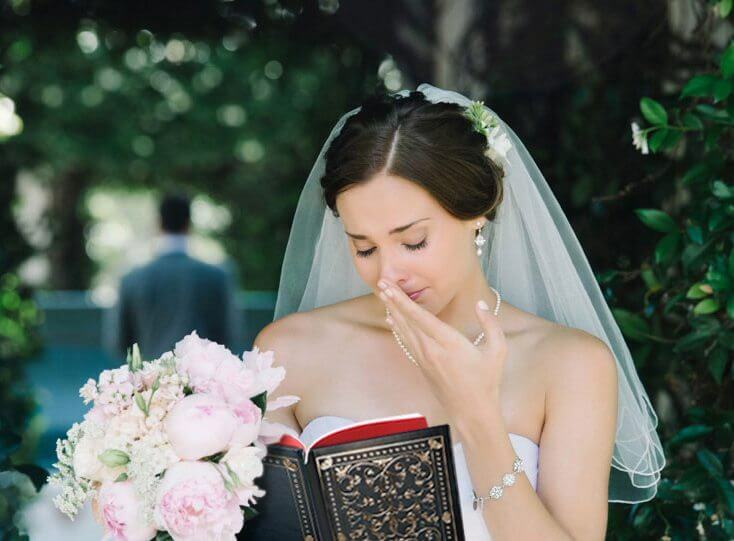 According to her bridesmaids, she couldn’t hold back the happy tears when reading the book. After the wedding she told me she would treasure it forever!